On the list of things that are more useful in video games than they are in the real world, grappling hooks are certainly near the top. Acquiring a grappling hook in the real world is positively thrilling, until you start thinking of ways you can actually (and legally) use it. Fortunately, the aptly-titled Grappling Hook isn't grounded in reality. The puzzle platformer from SpeedRunGames is filled with 22 levels of quick-thinking grappling goodness that is sure to keep you zooming around for hours. Played in the first person, the goal in Grappling Hook is to get through the challenges that have been set by a malicious computer. In the first few levels, this is accomplished by moving around with the [arrow] or [WASD] keys and jumping with the [spacebar]. The diamond-shaped access codes scattered around the level must be collected in order to advance, and there are plenty of checkpoints located throughout the level to save your progress. Once you've finished a few levels and gotten the hang of the game, you are given the titular grappling hook and things start to get crazy. 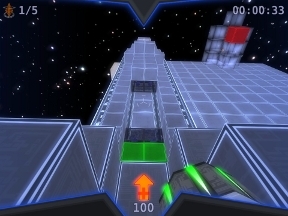 You can click and hold the mouse button to latch on to green surfaces in order to reaches places that can't be accessed with simple running and jumping. Speed is the name of the game here, as there are electrified blocks, moving walls, and laser turrets all waiting to end your life. And get used to dying from all of these, as it will happen. A lot. Fortunately, you never run out of lives, and save points are frequent enough that you won't have to overcome the same obstacles too many times. Analysis: There's a lot to love in this fast-paced platformer. Beyond the fact that it's all about grappling onto stuff, of course. The puzzles seamlessly combine timing, quick thinking and dexterity, making it impossible to finish the game without mastering all aspects of gameplay. The developers have done a great job of throwing out new challenges, with something new coming at you at all times. As mentioned previously, you're being ordered around by a maniacal computer, which doesn't have a huge presence in the game, but adds a nice bit of personality with its clever dialogue. What's that? Sounds like another first person puzzle adventure game you've heard of? Grappling Hook plays and feels somewhat like Portal in many respects, but don't let that color your experience too much. Grappling and portal opening are two totally different sports. One thing Grappling Hook could really use is some sort of directional indicator pointing you to the closest access code. They aren't usually too hidden, but a few times I reached the end of a level only to realize I had missed something and was forced to start all over. For you completionists out there, Grappling Hook provides plenty of challenges and achievements that can be earned as you progress. Once you've completed a level, you can go back and try to beat the challenge time, which is usually low enough to keep you working on it for a while. There is a particularly nice feature where you can provide your Twitter login information to have all of your achievements automatically posted, although this is purely optional. Whether you want to share your accomplishments with the world or not, there are plenty of challenges to keep you busy long after you've finished the main portion of the game. All in all, the game does a wonderful job with the first-person point of view and creates a surprisingly immersive environment. Pair that with smart puzzles and plenty of fast action and you'll stay grappling for a very long time! Here's a question: Is the demo supposed to end after level 1? Because it won't take me to the next level. Is it supposed to run? Because it doesn't work for me in any standard resolution, windowed or fullscreen. Thanks a lot for the review! 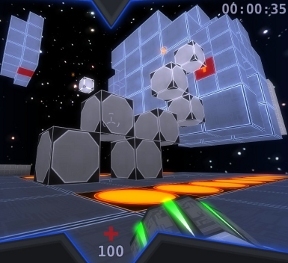 The demo includes the first 5 levels of the game. "On the list of things that are more useful in video games than they are in the real world, grappling hooks are certainly near the top." Also on the list: lasers, barrels, and ham found lying on the street. A new version is available, that fixes startup-crashes and issues related to the sound-system. this game reminds me so much of portal its not even funny. the first person puzzeler, the evil computer, the handheld device that alows your self to move though space,and the testing facility. really, this needs to be more original. nice game though. Newly upgraded to Norton 2010 and it refuses to let me run this executable (and even removes it) no matter how many times I tell it to let it go. Is there a message, why Norton 2010 refuses to run the executable? Program launches, music plays, and I see the intructions (wasd, etc.). Program goes through the loading steps, then crashed when it displays "Launching Grappling Hook (5/5)"
Please always make sure, that you have installed the latest graphics drivers. Grappling Hook requires at least Java 1.5. Mac OS X 10.4 only supports Java 1.4.2. You need at least Mac OS X 10.5 to play the game. there were already a lot of smart puzzles before the last update, but now with the new 8 levels it is awesome!!! i think every quake 3 player will love this. I think even my Mom would have fun, playin' this... LOL! nice game, i like it!!! Eight additional levels and a level editor are part of the last update for the full version. For more information visit the developer-blog. This game is a lot of fun and I definitely recommend anyone with spare time to check it out. Sweet game. I just finished Portal, and then picked this one up. Perfect. Grappling Hook costs now only $14.95. Bought it for $14.95, and I do think it was worth it. Comparisons to Portal are inevitable, but since when is that a bad thing? The mechanics are much different and throws plenty of surprises at you along the way. The game even gives a little nod to portal if you get far enough. Some of the time challenges are insanely low, and the bonus levels add some replay value as well.